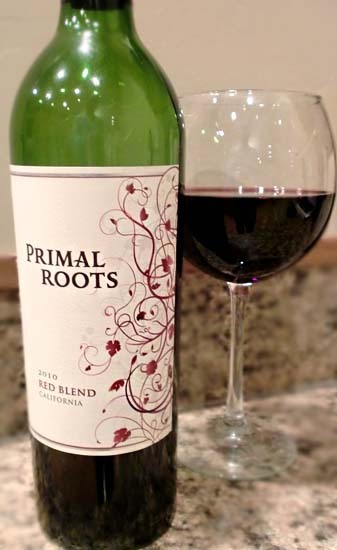 Here is another red wine blend from California, the 2010 Primal Roots Red Blend. I always find blends interesting. Not necessarily because they're all that good, but because this is the result of someone trying to mix a few different styles of wine from multiple batches and vintages and come out with something that tastes desirable. At least that's their hope, I'm sure. Blends usually seem to be mild and easy-going, with only a couple here and there worth seeking out. This wine is, like I said, another California-based wine blend. It contains 43% Merlot, 37% Syrah, and 20% Zinfandel. The winery reports that 90% of this wine came from the North Valley because they had such a great growing year. The 2010 Primal Roots Red Blend pours a surprisingly dark garnet color with aromas of raspberry jam and vanilla. Tasting brings sweet strawberries, raspberry jelly, and a soft bit of vanilla and mocha lingering throughout. This isn't a bad blend, especially being under $10. It is a touch sweeter than I was expecting, but there is a good bit of underlying dry mocha notes that really keep it from being overly fruity and sweet. All in all, not a bad everyday type of wine, if not a bit too straightforward. Don't Drink This: if you're looking for something deep and complex.